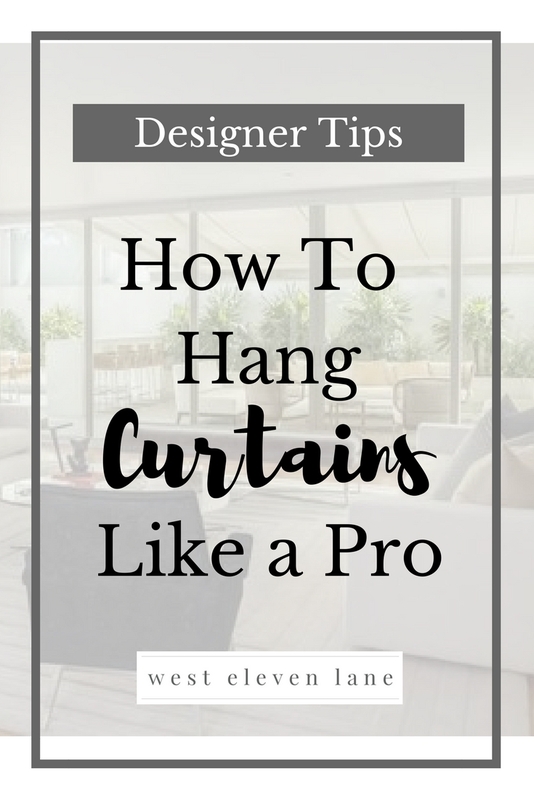 I’m excited to share some quick tips on how to hang curtain panels so they will make a dramatic impact on any room. The added bonus? We’re going to bring a lot more extra daylight your way. If you’re anything like me, you’re already missing that extra sunshine that Daylight Savings Time has stolen away and you’re ready to maximize the light that you do have coming in. So let’s get started. I’m sure you’ve heard a lot of talk around how high you should mount a curtain rod (5-6″ above the top of your window casing). But there’s not a lot of talk about how wide to mount it. The outside edge of your panels should sit between 16″ and 20″ outside of your window casing. Not only will this clear off your entire window to let in more light, but it will also turn the window into much more of a feature in the room. So how high off of the floor should your panels fall? You have a few options. Of course, you can allow your panels to “kiss” the floor or even pool for a more formal look. If you would prefer for the panels to hover, aim for 1/2″ off of the floor. Whatever you do, avoid hanging panels so the bottom falls any more than 1/2″ from the floor. Seriously just say no to curtain high waters…they are sooo out of style. This might make you wonder why 84″ panels are so widely sold as “standard” if they’re not the appropriate length for most walls. The answer? There’s a price break on fabric that occurs at 84″. That’s it. What a silly reason to mislead us all. Hem a 96″ panel down the appropriate length based on your measurements. Measure an existing panel and calculate the difference in extra fabric that you will need to bring the panel to the correct length. Don’t forget to account for a tad extra overlap where the two pieces connect as well as for the final hem. Head to JoAnn Fabrics or Hobby Lobby and find a sweet coordinating fabric that they can cut right there for you. Iron or steam your panels before you hang them to remove the creases. For best results, lay them out on a bed or a sofa until they are ready to be hung. Once the panels are up, follow the natural folds of the fabric beginning at the top to create pleats. Once you have even pleats throughout, wrap them carefully in a paper towel and tape the paper towel shut. Leaving the paper towels on for 48-72 hours will help you to achieve that designer look. And that’s it! Go forth and tackle this project today, my friends. I promise it will make an impressive impact on the visual aesthetic of the room and improve the mood and energy of all who enjoy it.